Pearl version of the compact American DJ Inno Pocket Spot Moving Head, powered by a massive 10W LED source makes this the smallest most powerful moving head on the market. Packed full of features with 7 Colours + white Gobo's and colour wheel. Easy control with sound active and 4 amazing built in shows and the option for full DMX control. 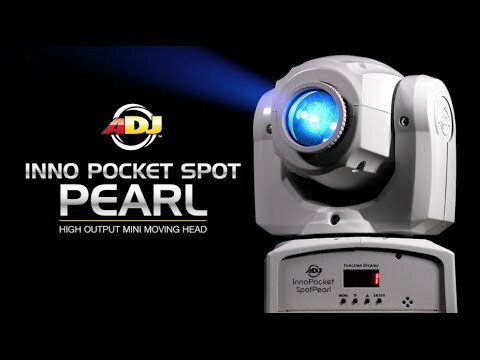 Considering purchasing the American DJ Inno Pocket Spot Pearl? Have questions? Ask people who've recently bought one. 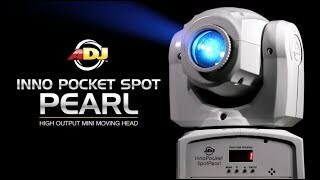 Do you own the American DJ Inno Pocket Spot Pearl? Why not write a review based on your experience with it. A great fixture which is very versatile and well built. The output is great from such a small light and the movement is fantastic. But most importantly the price is great. I love the white casing on this fixture which makes it perfect for wedding DJ's. Highly recommend this fixture!! Got a pair of theses and ran them linked, produce a great show and are really bright. Think they will provide and even better effect once i run them through a DMX controller. Great lights for the price and DJKIT delivered on time and well packaged as always. Small but packs a punch ! Fantastic fixtures , remote features are outstanding when paired with a second unit . ADJ usual well built casing , robust and pretty easy to plug and go , amazing show options , I would recommend master / slave options and inverse tilt and pan to get the most out of the built in shows. Works well on a T bar and classy pearl units are great for weddings . Seen a video for American DJ Inno Pocket Spot Pearl online or have you own video? Check out American DJ Inno Pocket Spot Pearl on DJkit.com!